"The Contribution of the South African Constitution to Kenya's Constitution"
Introduction: There is no such thing as an original constitution. And there is no sin in plagiarizing another country's constitutional ideas (or more importantly, learning from their experience). South Africa's own debt to other countries' constitutions – particularly those of India, Canada and Germany – is evident. In the last seventy or eighty years, probably more constitutions have been enacted than in all the centuries before. These constitutions are widely available and their performance widely analyzed. There are numerous books on these (and past constitutions) and some handbooks on the best strategies and procedures for making a constitution, and how to design them for effectiveness. A number of significant regional and international treaties have been adopted in the last fifty or more years imposing obligations on states that influence the orientation of constitutions. International consultants (mostly from the West) on how to write constitutions and even who will “do it for you” have proliferated at an alarming rate. All these developments lead to borrowing of ideas and structures for constitutions. South Africa has both borrowed from some other countries and has had its own constitution copied. Constitutional borrowing (an odd word, since the debt is never repaid) is by no means restricted to situations where foreigners were intimately involved in a country's constitution-making process. Propinquity (in space and time), similarity of history, tradition and experience, of political orientation and vision, and of legal tradition, all play their parts. And so do personal factors: local constitution makers do not come to their tasks as personal blank slates. They have expectations of how things ought to be done, perhaps rooted in their own country's history, or they may reject how things were done in the past and look to other countries for inspiration on how to do them differently. They have studied, perhaps in another country, have perhaps worked in another country, have academic knowledge of other countries, even friends in other countries. South Africa's constitution-making process came early, though not the earliest, in the post-Cold War spate of processes. Its emergence from apartheid was an inspiration to other countries, especially in Africa. The country became a place of pilgrimage, literally and virtually, for other countries emerging from autocracy. Kenya's process did not really begin in 2000 when the first official constitution-making body (the Constitution of Kenya Review Commission or CKRC) was appointed. It began just over a decade earlier, and thus ran somewhat in parallel with South Africa's. One of the leading early activists, and chronicler of the Kenyan process, records that, in 1994, three organizations that had been working toward a new constitution held a workshop (funded by two German bodies); they reflected on the Constitutions of Uganda, Ghana, Namibia and South Africa. But they also discussed ideas from the USA and Germany. South Africa's final Constitution was adopted only four years before the official Kenyan process began. But there were other, more direct and more personal, influences. The Chair of the CKRC3 had been somewhat involved in the South African process, and had been very much inspired by the experience, and also had a number of South African contacts. A member of the CKRC had spent time as an intern at the Kenyan High Commission in South Africa and drew on what he learned especially in contributing to the debates on devolution. In phase two of the Kenyan process, when three foreigners joined the Committee of Experts (2009–10) (CoE), one of those foreigners was South African (Christina Murray). Another was Ugandan and the third Zambian, resident in the United Kingdom. South Africans came to Kenya at the invitation of Kenyans. Yvonne Mokgoro, Judge of the Constitutional Court, was a member of a panel of Commonwealth experts that advised on how to deal with the issue of a compromised judiciary – including a proposal for a vetting process to weed out the corrupt, incompetent and executive-dependent members of the judiciary. This was not a process inspired by South Africa. The CKRC held various workshops to educate itself about dimensions of the issue, including speakers on economic social and cultural rights in South Africa, and other aspects of human rights, on devolution in South Africa, and on electoral systems with considerable discussion of PR in South Africa. Another influence is almost certainly that of a drafter: Philip Knight is a Canadian legal drafter who played a significant role in the final stages of drafting the South African Constitution with the specific brief of making that document as “plain English” as possible. Yash Ghai admired the style, and thus proposed him for the Kenya process, phase 1. And he was also a major drafter in the CoE phase. Clearly the decision to draw on the South African experience had already been made; it was not Knight's initiative. But he almost certainly introduced some phraseology from that country. There were significant differences between the South African and Kenyan constitutional and political situation. The former was more like Kenya at independence: a past, in many ways alien, regime was being shaken off, and there was faith in the new leaders of the majority. But Kenya in 2000 was not a newly independent country: though it was capable of short periods of wild optimism, it was basically a country disillusioned by politicians, and determined that a new constitution would contain as many constraints on abuse of power, corruption and land grabbing as possible. And women, persons with disability and other groups that had felt marginalized over the preceding forty-seven years were equally enthusiastic to ensure that everyone was included in the new Kenya that they believed a new constitution (and the end of President Moi after twenty-four years) would – or should – bring. This disillusionment accounts for many of the differences between the South African and Kenyan constitutions. Another difference between the two countries was in the position of the political leaders. While the ANC wanted a liberal-democratic constitution, the Kenyan leaders wanted maximum powers and perks for themselves; their primary interest was to get rid of President Moi so they could assume government with the extensive powers that Moi had assumed for himself. The same differences were reflected in the implementation of the constitutions: South Africa's enthusiastically by political leaders, Kenya's the object of sabotage efforts. 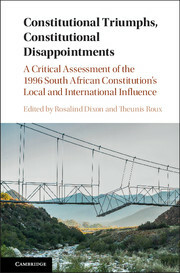 Between 2000 and 2010 when a new constitution was finally adopted there were seven official drafts of a constitution (a process of development but sometimes regression from the first draft in September 2002 to the one of May 2010 that was adopted in a referendum in August that year).7 There was no “big bang” acceptance of South African ideas. Some things came in early and stayed, like provisions of the Bill of Rights, notably s. 27 of the South African and Article 24 of the Kenyan on limitation of rights, and s. 38/Article 22 on right to standing to sue for breach of human rights – the constitutional basis for public interest litigation. The occasional thing came and went, like the terminology of “State President,” used only in the fifth version of a new constitution, and a constitutional court – in the fourth and fifths drafts; both were removed by the Parliamentary Select Committee (PSC). Some topics became gradually more South African, like devolution, which we discuss in some detail.